3pc Slim fit suit, 2 button, single-breasted jacket with side vents and vest, flat front pants, poly rayon. 2 Piece Modern Fit Suit, window pane pattern, 2-button, single-breasted Jacket with patch pockets, side vents and flat front pants. 2pc Slim fit tuxedo, 1 button, single-breasted jacket with peak lapels and center vent, flat front pants, poly-rayon wool feel. 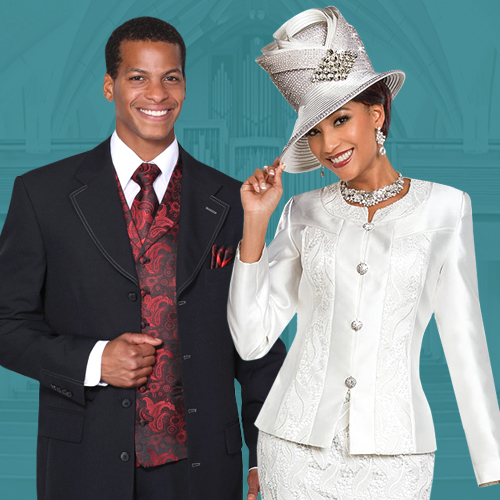 3pc Classic fit suit, 2 button, single-breasted jacket with notch lapels and double vents, flat front pants, premium poly-rayon. 3pc Modern fit suit, 3 button, single-breasted, double vent jacket, 5 button vest, single pleated pants, super wool feel poly rayon, available in many colors. 2pc Regular cut suit in poly-poplin, 2 button, single-breasted jacket with notch lapels and flap pockets, single pleated pants. 2pc Slim cut suit, heather fabric, 2 button, center vent, single-breasted jacket with slim notch lapels, flat front pants. Free hanky included.